The Westinghouse WGen5500 is a dependable and convenient way to supply power to your home during a power outage. The WGen5500 features 6,850 peak watts, 5,500 running watts, and a powerful Westinghouse engine designed with reliability and durability in mind. Built-in Automatic Low Oil Shutdown and digital hour meter on the control panel makes it easy to care for the WGen5500, ensuring long life and lasting utility. It's transfer switch ready which allows it to connect straight to your 30 Amp inlet box and power your home's outlets, making it a suitable emergency backup power source. The WGen5500 Portable Generator is complete with a 3-Year Warranty and Lifetime Technical Support to ensure your confidence can be backed by our nationwide Westinghouse customer service and support network. The WGen5500 portable generator is backed by a 3-year limited warranty and Westinghouse's lifetime technical support. Whether you are preparing for an approaching storm or powering up the job-site, The P08004 provides power on demand. Best used for emergency power, construction work-site, farm/ranch, large RV's and buses. XC Professional Series Portable Generators are engineered specifically for contractors and construction sites. Featuring Generac's G-Force engine the only pressure-lubed engine designed exclusively for generator use. The G-Force engine provides reliable and durable best-in-class power on any jobsite. In addition, the X-Frame design improves durability by protecting the generator and fuel tank from damage making this generator capable of withstanding all the elements of the jobsite. 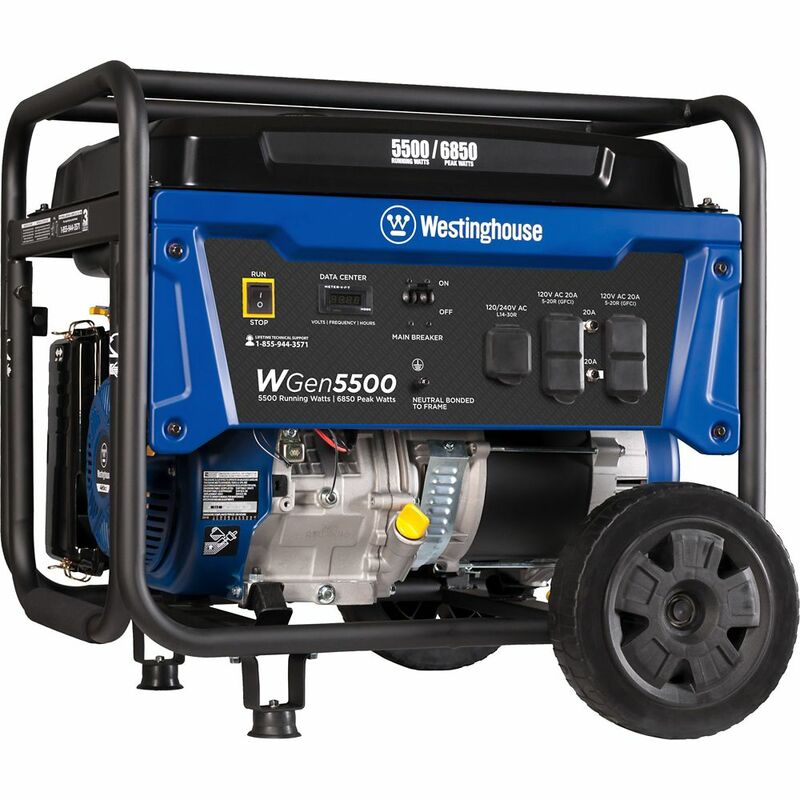 WGen5500 Portable Generator The Westinghouse WGen5500 is a dependable and convenient way to supply power to your home during a power outage. The WGen5500 features 6,850 peak watts, 5,500 running watts, and a powerful Westinghouse engine designed with reliability and durability in mind. Built-in Automatic Low Oil Shutdown and digital hour meter on the control panel makes it easy to care for the WGen5500, ensuring long life and lasting utility. It's transfer switch ready which allows it to connect straight to your 30 Amp inlet box and power your home's outlets, making it a suitable emergency backup power source. The WGen5500 Portable Generator is complete with a 3-Year Warranty and Lifetime Technical Support to ensure your confidence can be backed by our nationwide Westinghouse customer service and support network. WGen5500 Portable Generator is rated 4.7 out of 5 by 329. Rated 3 out of 5 by Ron from When I ordered this I didn't know it wasn't electric start. This is my mistake. When I ordered this I didn't know it wasn't electric start. This is my mistake. Rated 5 out of 5 by Randall P from Very reliable Purchased this during a power outage, worked great. Rated 5 out of 5 by Mesha from Generator runs smooth and is very quiet. Easy to assemble too. Generator runs smooth and is very quiet. Easy to assemble too. Rated 5 out of 5 by Rsargo from Great Generator This is the perfect size generator for a two-story home. Very easy to setup and operate.